Time for a second pass and Hall is into the track at 179.88kts... clean and precise, it's textbook flying from Hall but he's still lacking the pace that Dolderer found from his aggressive flight earlier in this Qualifying session. Beautiful flying though from Hall, and by all accounts it's going to be a different racetrack as conditions are set to change overnight, so perhaps no need to nail those lines so precisely today. Hall consistent as ever and it's a good sign ahead of he R14 tomorrow as he clocks into fourth place overall so far. 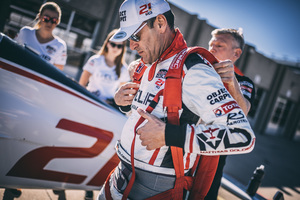 Czech pilot Sonka is the penultimate pilot in today's Qualifying session - another pilot looking for his first World Champion title, he's shown some superb form this season despite a difficult start. Sonka looking quick and composed, although there's a sense that he's just holding something back a little. Sonka showing superb form in the track and he seems calm despite the pressure that's built in the second half of this season as he lines up for the win. Sonka's first VTM is blistering, he's handling the high-G with perfection and the pace is finally there... he's blasted his way home to a second place overall so far and that's a clear challenge for Goulian and Hall. Goulian is the last pilot into the track or today's Masters Qualifying session. He's looking composed but doesn't seem to have perfected his lines quite yet as he takes a long roll out of the VTM and it's adding time to an otherwise competitive and clean run. It finishes him up in 12th place overall so far but there's another chance to take a giant leap up the Qualifying timesheets. He's in at 178kts... he's done it again, rolling the wrong way in the VTM and that's really affecting his heading into the next gate. That's a massive factor for consideration tomorrow as Goulian cannot get close to Hall or Sonka in the timesheets... something that could cost him the title at the close of business tomorrow. Goulian moves up to 9th place overall. Need to get up real early for heat 1. 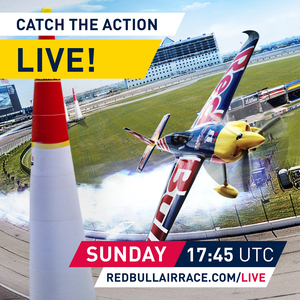 Join us from 11:45am local time/17:45 UTC tomorrow as the Challengers go head to head for the final Challenger Cup race this season, followed by the very last Master Class Round of 14 for 2018. 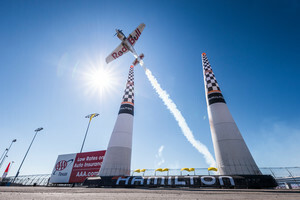 It's a three-pilot showdown in Fort Worth, as Mike Goulian, Martin Sonka and Matt Hall battle it out for the World Champion title, with all 14 pilots going full throttle for the epic race win at the season finale. Stay tuned for the Qualifying press conference... otherwise - see you tomorrow for all the Race Day action! Hello from Fort Worth! We're finally here - the season finale is about to drop and the Challengers are getting prepped for the race that will decide the 2018 Challenger Cup Champion. The Masters will be racing from 13:00 local... are you ready?! Kenny Chiang is DNS so Kevin Coleman will be kicking off proceedings. And this is it... the Challenger Cup final IS ON! Coleman out into the track first at 178kts, he's through the Start Gate and he's dealing with completely different wind conditions out there, he's through the VTM and he's through Gate 7... looking a little safe and his lines seem to be on the long side... the buzzer goes and at Gate 9 he's picked up +2s for incorrect level flying... that's most likely his bid for Champion over! Disappointment for the US pilot. Poland's Luke Czepiela up next... he may have heard Coleman's time and if Czepiela flies penalty free, he could well be on the podium. Race Director clears Czepiela into the track and it's a little slower at 177kts... no surprises, he's in the green as he takes that first chicane. Smooth and controlled from Czepiela - really beautifully done - but a late pull up into the VTM which could add precious hundredths of a second... a little conservative again, these wind conditions are making the pilots work really hard out there. Focus and speed, but still lacking on the pace out there. A slight wobble but he's managed to go wings level and it's a clean run. He takes the top spot and he just needs to keep on the podium now. France's Baptiste Vignes next into the track. He took 4th place in Qualifying but managed two first places in Free Practice. Vignes through the Start Gate at 180kts, that's a quick start and the first splits are in as he clears the chicane - he's in the green at 0.2s faster than Czepiela. First VTM is clear... But it's a penalty for Vignes at Gate 7! He's picked up +2s for Over-G and that could knock Vignes off a podium finish. It's otherwise controlled and clean flying from Vignes but that +2s pushes Vignes down into third. He needs Ryfa and Berger to make some serious mistakes if he's to hold onto that podium place. Looks as though Czepiela will be on the podium today though. Quick interval whilst the Challengers swap planes. They're sharing three Edge 540 V2s for 2018, helping to prep them for the move up to the Master Class. Ryfa and Berger still to fly. And we're back... Ryfa the penultimate pilot out in the racetrack for the Challenger Cup finale. 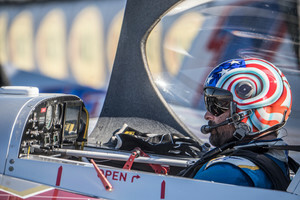 Ryfa is ice-cool under pressure and could be the pilot standing between Berger and the title. Ryfa is cleared into the track! he's in at 178kts... the goal is 57.7s and the first splits are in the green as he goes 0.2s faster. First VTM is tight and tidy but he's through Gate 7 and it looks like an early turn has cost him +2s... the splits are in the red and Ruyfa cannot claw back any time in the track. Ryfa goes into fourth place overall so far and Czepiela stays on top - only Berger can topple the Polish pilot off the top spot. Berger is getting airborne and Czepiela it's sweaty palms for Czepiela as he waits to see if he can take the title for 2018! And this is it... all or nothing... Berger is into the track! Berger into the track and he's late into that VTM... interestingly the splits are in the red and Berger looking a little safe and conservative. Remember it's cold and the wind direction change means different conditions out there. Next splits are in and Berger is now in the GREEN... he's just got 0.020s on Czepiela... clean and steady through that last section... but Berger cannot take the lead and he's through cleanly, just 0.052s behind Czepiela! That gives Czepiela the race win but will it give him the title? !